One has to assume that Ferrari joined the hybrid car movement due to the fact that they think it’s a trend. Ferrari and the word savings simply don’t go hand in hand. But, the new LaFerrari is their version of the hybrid car and while it still looks cool, they are contributed their part to the green effort. Ferrari’s version of the hybrid is just that, kind of what the rest of the automotive makers were releasing ten years ago. It’s not real progressive, but, it does give the owners the ability to at least act like they are doing something for the environment. The specs for this new creation includes a V12 6.3 liter engine that has a rating of 789 hp. It has a pair of electric motors that work with the seven speed, dual clutch transmission that produces around 161 horsepower. This brings the total output to around 950 hp and 660 lb ft of torque. Pretty impressive, but just a day in the life for Ferrari. There are other manufacturers that are making really cool hybrid and total EVs, and that even includes some of the world’s top sports car makers. Tesla alone has captured the minds and hearts of every techno geek out there that wants a cool and ‘green’ vehicle. 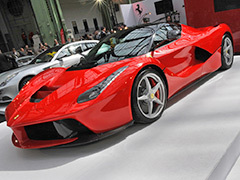 However, with that said there is just something intangible about the concept of a Ferrari. None of those reading this will probably ever drive one, although we might see a standard Ferrari (usually rented) on the road. The LaFerrari isn’t really selling super well, but there is a limited and specific market for Ferrari buyers and the manufacturer knows and understands their niche better than anyone. If nothing else, Ferrari can ease their conscience by stating that they are making a contribution to helping the planet, even if it is expensive. Posted on July 29th under Renewable Electricity.